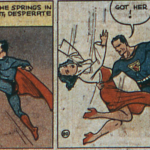 54 – The Crimson Avenger! 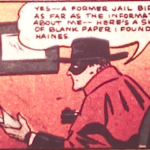 September 1938 also saw the debut of The Crimson Avenger in Detective Comics #20 by Jim Chambers. 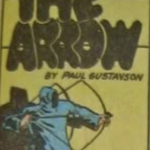 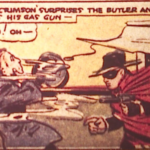 Basically the Crimson Avenger was a knock-off of The Green Hornet, having a mask, a gas gun and an Asian sidekick named Wing – but he is DC’s first masked hero, so I guess he deserves a mention. 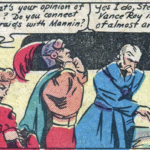 Bill Everett started in comic books with “Skyrocket” Steele, a Buck Rogers / Flash Gordon clone in Centaur Publications’ Amazing Mystery Comics #2 (August 1938). 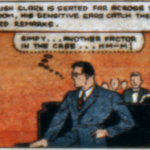 Everett would later go on to create Namor, the Sub-Mariner for Marvel / Timely Comics. 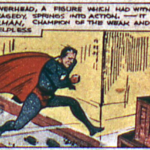 Superman‘s powers grew over the years, but being bulletproof was one of the few that were there from the beginning (the other two being increased strength and speed). 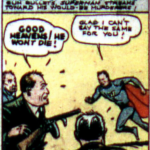 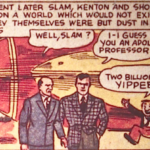 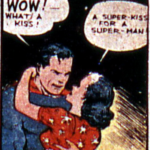 Above is a panel from Action Comics #2 (June 1938).